The UNT Welcome Center opened this month at the corner of Maple and Highland streets, offering guests, prospective students and their families an easily accessible location to begin campus tours. 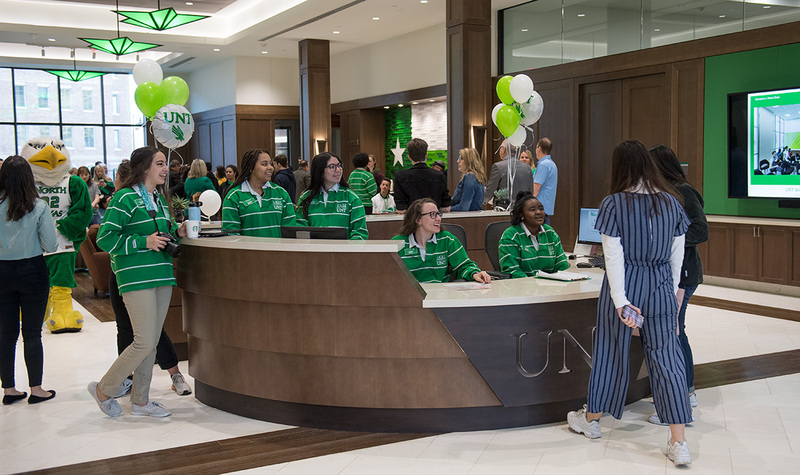 This month we celebrated the opening of the UNT Welcome Center, our new "front door" to greet prospective students, families and guests when they visit our caring and creative campus. With thousands of visitors annually touring UNT, the Welcome Center's centralized location at the corner of Maple and Highland streets and across from the Highland Street Garage will be easily accessible for all. Read more about the Welcome Center in this issue. You'll also read about two M.B.A. students who won $20,000 in the Ed Tech Ascend pitch competition, faculty experts to be featured on the National Geographic channel, and our most recent U.S. News and World Report rankings. We've also included information about Mean Green Athletics' April 6 fan appreciation day which features the football Spring Game, ribbon cutting for the North Texas Soccer and Track Complex and a softball double-header. Thank you for your continued support of UNT! Connect with me on Twitter @UNTPrez for more highlights about our amazing Mean Green community.